"When we are open and giving of our light, we create an endless reflection that outlives our human existence." BELIEVE - Having faith in our children's potential. "It's possible. You've got this. Win, win, win!" To create experiences of true connection while revealing the dynamic potential of each child and nurturing magic family moments. When you access more than one service with us, you get a team of specialists. From the start, our assessments involve a multidisciplinary team of clinicians, assigned as part of a personalized team for your child. Together, we value a TEAM APPROACH, customizing a therapeutic plan that includes all of the areas of development they need to become strong and successful, How do we do that? By integrating our therapists' collaborative training across five main disciplines towards individualized goals that lead to transformative life moments. We offer Speech-Language Therapy, Occupational Therapy, Developmental Therapy, Social Work/Behavioral Therapy and Physical Therapy. This proven process allows us to address your child’s needs in a nurturing and loving environment and in a patient and trusting manner. Our top priority is blending your family’s goals with our clinical expertise and knowledge to provide a blueprint for growth, true connection and trust. Once we get started, we have a full complement of services that can support your child on their journey. 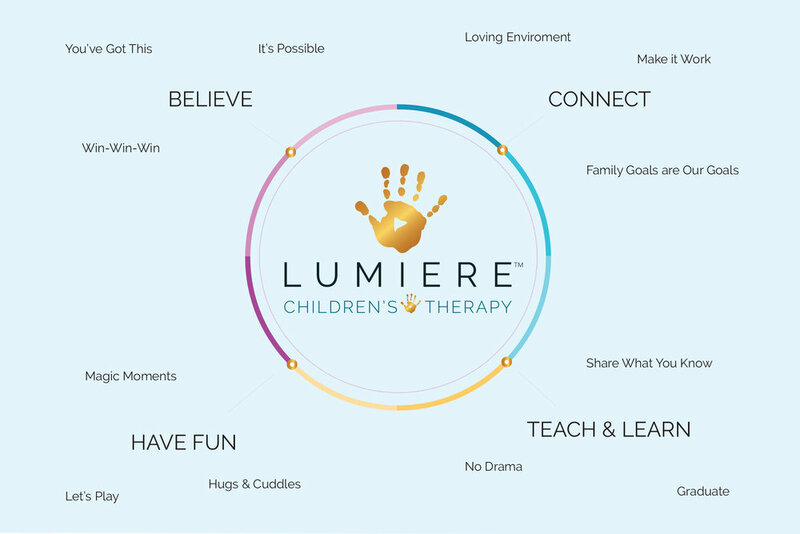 Lumiere Children’s Therapy offers programs that include social skills groups, various therapeutic play groups, a therapeutic preschool, and ABA Therapy in an interdisciplinary environment to ensure your child gets the best treatment plan available. In the end, we want as much independence for you and your child as possible. We want you to feel as if your time with us was well spent and that you can continue forward, embracing all that is yet to come. Our goal is to help your family on its journey with empathy, honesty, and expertise. Lumiere helps create the best support system your child could have.